The benefits of antibiotics to both human and animal health are undisputed. However, as microbes have become increasingly resistant to antimicrobials and other drugs, scientists have become interested in new solutions to the growing superbug crisis, including the use of defensive microbes and faecal transplants. In new research, Oxford University scientists have developed a lab-based approach, creating positive co-dependent relationships between hosts and bacteria, termed 'mutualisms', quickly. These lab-developed bacterial relationships demonstrate how microbes can work with their hosts to prevent infection. Defensive host-microbe relationships are prevalent in nature across plants and animals, including humans. The mutual benefit comes from the host benefiting from the protection of the bacteria, and the bacteria then benefiting from the host being a healthy living environment—allowing it to accumulate further over time. In a study published in Evolution Letters, scientists from Oxford's Department of Zoology worked with the University of Bath to test whether these defensive host-microbe 'mutualisms' could evolve from scratch to protect against attack from harmful and infectious parasites. Of the difference between this research and other bacterial symbiosis studies, Dr. Rafaluk-Mohr, said: 'In itself, hosts and bacteria forming co-dependent relationships is not a new concept. However, our study is the first to develop this relationship from scratch. Some 'mutualisms' take years of evolutionary history before they reap any defensive benefit, but in our case, the relationship was developed and formed in a matter of weeks in a laboratory—before that the host worm and bacteria were completely foreign entities. To understand when defensive mutualisms are most likely to evolve in nature, the team worked with Dr. Ben Ashby from the University of Bath to study mathematical models of coevolving hosts and bacteria. 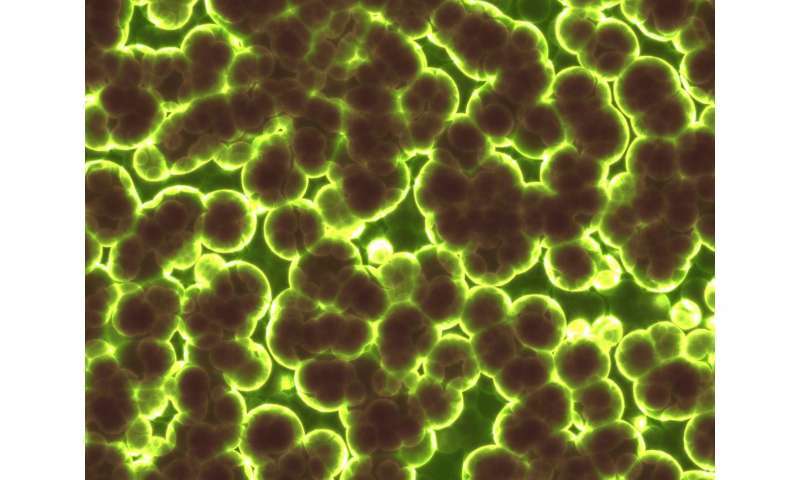 The models predict that if protection is too low, then there is little benefit to the host of harbouring the bacteria, but if protection is too high then other microbes may be wiped out, removing the need for protection. It is therefore when microbes provide a moderate level of protection that 'mutualisms' are most likely to evolve. Understanding the origin and maintenance of defensive relationships between hosts and their "good bacteria" are pressing questions for evolutionary biologists. The team found that the speed of the relationship's evolution could have a significant role to play in its overall success, and also in its potential use as treatment for human health. As Dr. Rafaluk-Mohr, explains: 'We have an increasing problem with antibiotics not being able to treat disease, and our research shows that both using and engineering 'mutualisms' has the potential to benefit people by preventing infection by disease causing parasites.' The study also indicates that the interaction of host and microbe genetic background may play a role in the establishment of these host-bacteria defensive relationships, and thus the potential success of bacteriotherapy and faecal transplants, for example. Dr. Kayla King, senior author and Associate Professor in Parasite Biology at Oxford, added: 'Entire human and animal bodies are covered in microbes inside and out. Many of these bacteria can help by defending us (their hosts) against attack from harmful parasites. Essentially, a slightly parasitic relationship develops to become mutually beneficial. More information: Mutual fitness benefits arise during coevolution in a nematode defensive microbe model, Evolution Letters, 2018.